This book examines reason and unreason in the legal and political responses to terrorism. Terrorism is often perceived as sheer madness, unreasonable use of extreme violence and senseless, futile political action. These assertions are challenged by this book. 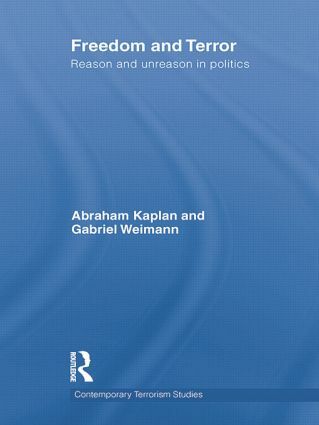 Combining ‘traditional’ thought (by Kaplan) on reason and unreason in terrorism with empirical explorations of post-modern terrorism and its use of communication platforms (by Weimann) the work uses interdisciplinary and cross disciplinary dimensions　to provide a multidimensional picture of critical issues in current politics and a deeper examination of their implications than previously available. The book looks at various aspects of modern politics, from terrorism to protest, from decision-making to political discourse, applying the perspective of philosophical thought. To do so, political issues and actions are examined by using concepts such as reason, emotions, madness, magic, morality, absolutism, extremism, psychopathology, rationality and others. The analysis is rooted in theories and concepts derived from history, philosophy, religion, art, sociology, psychology, and political science. This book, which was mostly written by the late Abraham Kaplan, an American philosopher, and edited and updated by Gabriel Weimann, will be of much interest to students of political violence/terrorism, philosophy, war and conflict studies and political science in general. Abraham Kaplan (1918-1993) was a leading American philosopher and author of six books. Gabriel Weimann is a Professor of Communication at the Department of Communication at Haifa University, Israel, and the School of International Service (SIS) at the American University, Washington, DC.